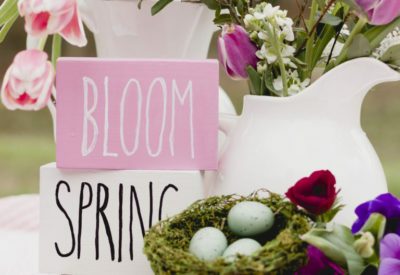 Welcome to Easter inspiration from some great bloggers! 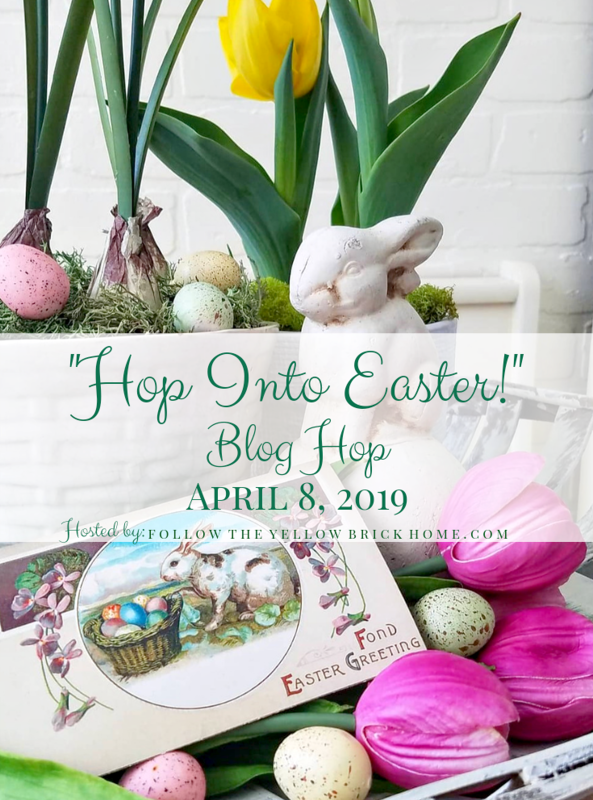 Amber at Follow the Yellow Brick Home is so generous to organize this Hop into Easter Blog Hop! 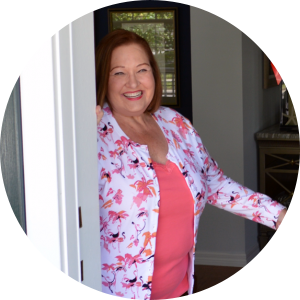 I am happy to have welcome you into my home for a glimpse of decorating for Easter and spring! 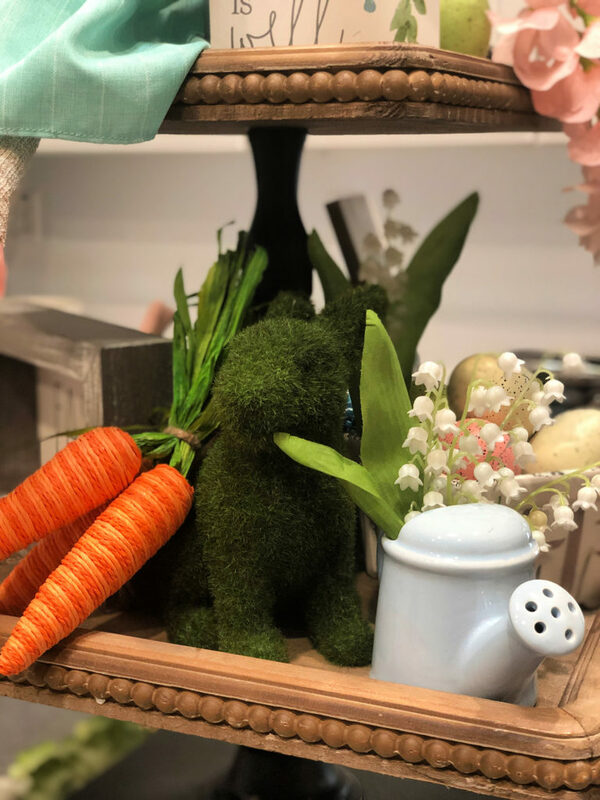 This sweet little bunny is a new addition from Home Goods this year. She is tickled pink to be hanging out in the kitchen. All is Well is a Christmas song. It is also an appropriate phrase for the celebration of Easter and the salvation brought to us through the Cruxifixction. If you have a moment, listen to my favorite recording of this song by Voctave. I love to have fresh flowers in my home. 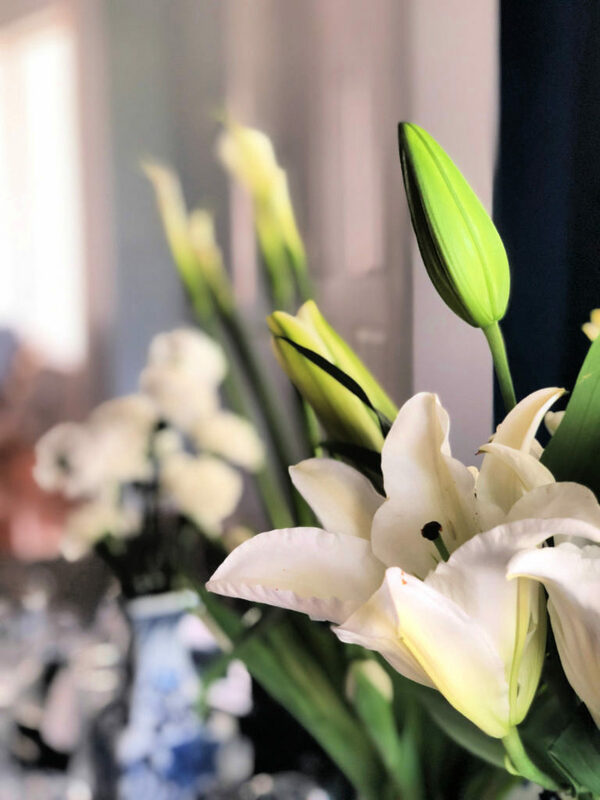 White lilies, even these asian ones remind me of the hope and joy that comes in celebrating the gift given to us through the celebration of Easter. 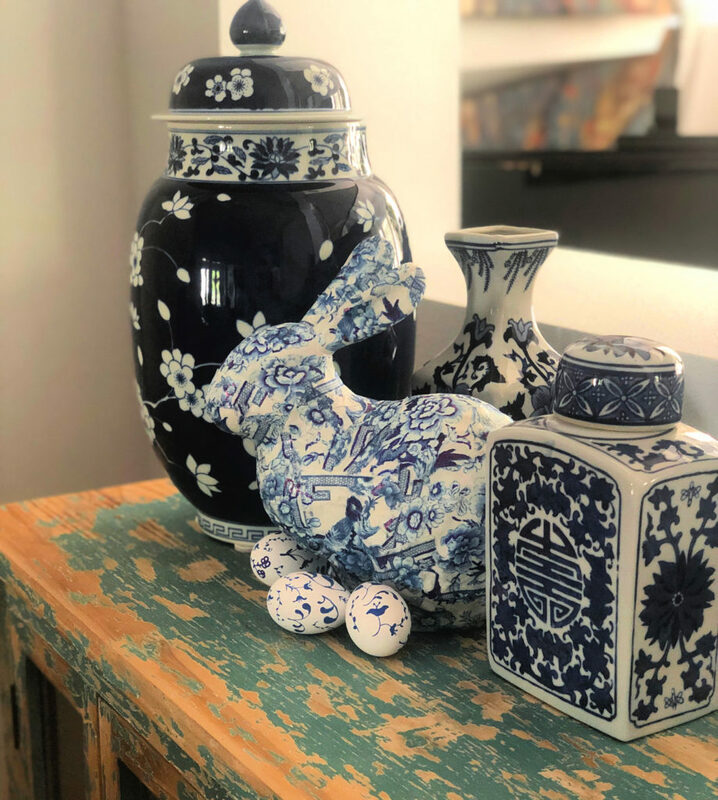 This decoupaged chinoiserie bunny and hand painted eggs were on my Easter Tablescape, but I didn’t want him to get tucked away quite yet! Bunnies seem to be hopping around everywhere for Easter. These artificial ranunculus brighten up the coffee table without any watering. The bunny rabbit carries a pack of the same ranunculus and some springtime dogwood blossoms. 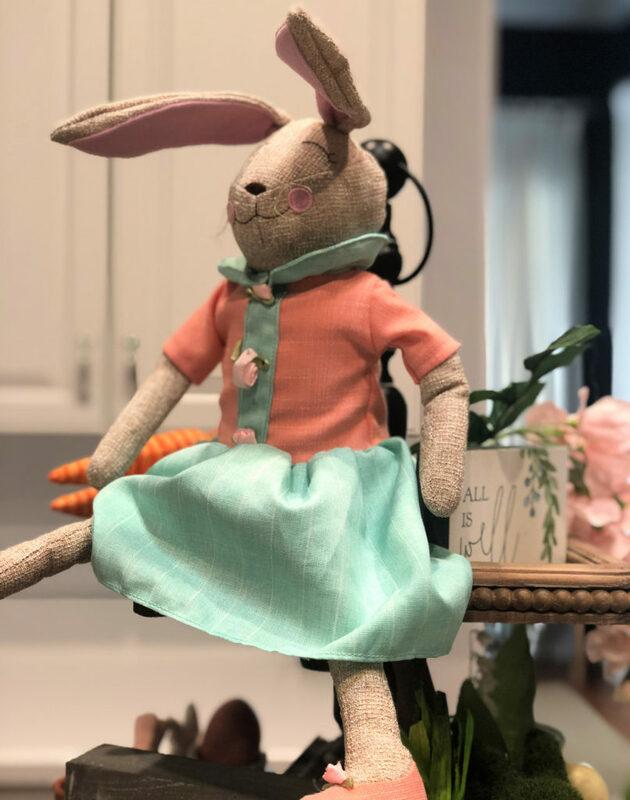 Come on in the family room and enjoy all of the decorations for easter and Spring! I added a colorful quilt and flowers to my blanket ladder to brighten up the room. Mr. and Mrs. Bunny are hanging out on one end of my mantel this year with a jar of pink petals and bird nest nearby. 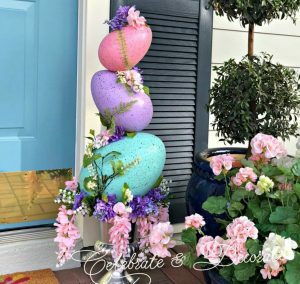 I hope you enjoyed hopping into Easter at my house with all of the ways I have been decorating for Easter and spring! Hop on over to visit all of the other blogs! Next up, one of my favorite blogs, White Arrows Home! I adore your collection of rabbits. Mrs. Bunny with the spectacles is truly charming! 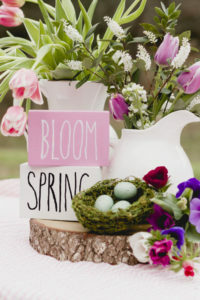 What lovely spring filled Easter decor! Your bunnies are so sweet! What a delight to the eye! Your bunnies and displays are so fun. Great tour. All your bunnies are adorable. So, so cute. What a treat. Your Easter decorations looks so cute. I have a couple of the same bunnies and carrots! I love them. Great hopping with you. Happy Easter! 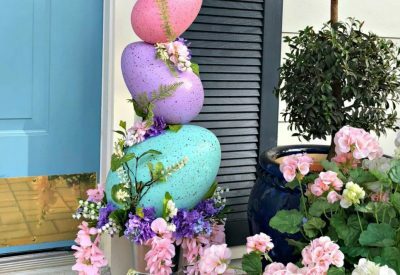 Chloe, I love all your Easter/Spring vignettes. I really love the tier tray. Those trays scare the livin’ death of me. You make it look so easy. Happy Easter! I love all of your sweet and whimsical bunnies, Chloe! So perfect for Easter and spring! Thanks so much Linda! You can never have too many bunnies at Easter! I love “All is Well”, Chloe. And you’re right, it is more appropriate for Easter with Christ’s great sacrifice! Love all your adorable decor! Fun hopping with you! Thank you so much Lora. That song is so moving! Chloe, I love your Easter decor! It is so pretty and festive. 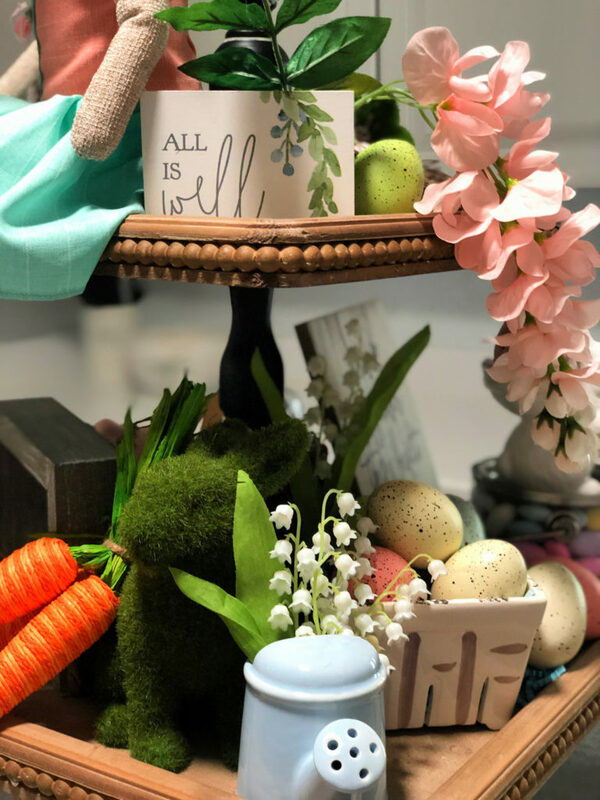 I rarely decorate for Easter…the table is about it. I do have a few things, I just don’t put them out. I need to dig out a few things and at least sit them on the mantel. 🙂 Hugs! I don’t do a lot, I probably did a little more this year than I usually do! Thank you! So many darling bunnies, and so beautifully styled! I especially love the blue and white bunny, sooo cute!!! I enjoyed listening to “All is Well” while I admired your pretty Easter decor. Your home looks lovely and I’ll bet that your guests love looking at your pretty decorations. Thank you so much Paula! That group is lovely, aren’t they? Thanks for visiting! Thank you so much Jennifer! Oh, those inlinkz issues are ridiculous! Why did they have to mess with things when they were working just fine? Love the Lily of the Valley in your tiered tray vignette. So sweet! Hope you have a wonderful Easter! Thank you so much Michelle! 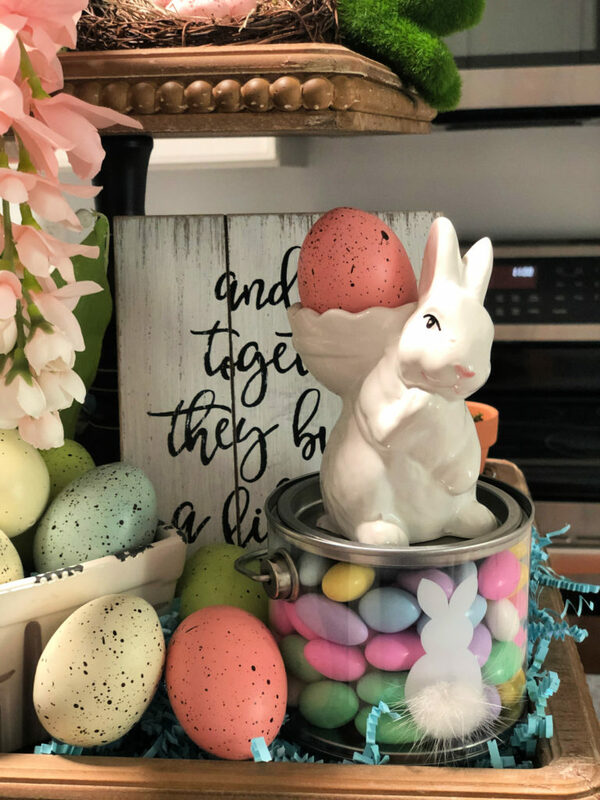 My tiered tray ads some pretty Easter decor to my kitchen! So many fun Easter pieces! 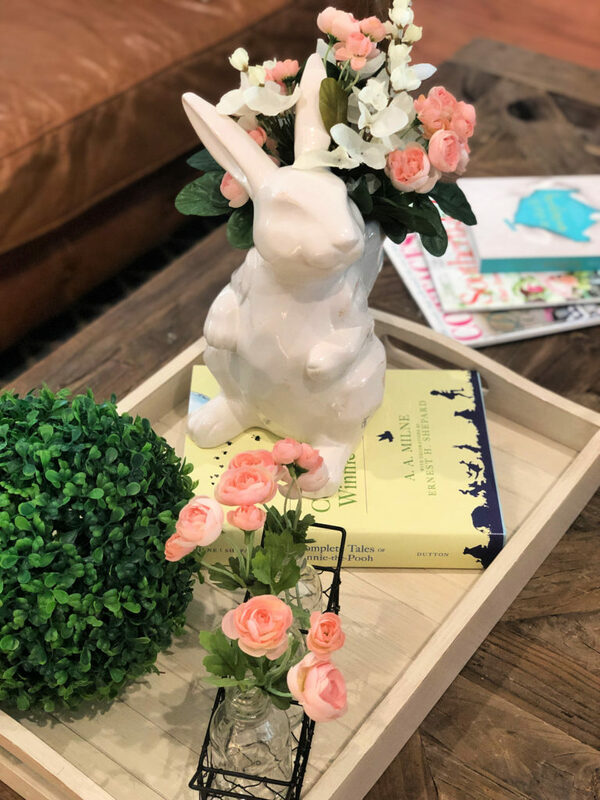 I love your new bunny from Homegoods and how you styled your tiered tray. I LOVE the All is Well sign for Easter. I love that song too! Love touring with you!! Thank you Kristin! Visiting White Arrows Home is always a treat, too! 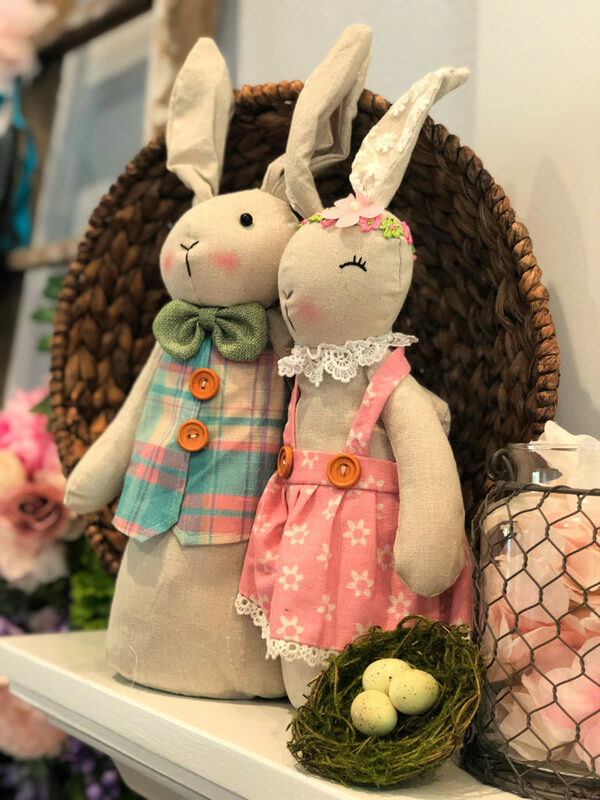 Adorable bunnies and so many pretty Easter pieces! Your home looks so festive for spring! Thanks so much Shelley, it was fun hopping with you! Hi Chloe, I love all your wonderful Easter decor, and that Chinoiserie Rabbit is amazing! Have a Happy Easter! Thank you so much Debra! Happy Easter to you! Chloe, as always, enjoyed viewing you charming, seasonal decor. Love, love the large egg topiary on the mantle. Is that the DIY project you shared previously? I’ve got it on my want to do that list. Yes, Debbee, I have a DIY for that project from last spring! They still had the eggs at my Michael’s this week, and the price is getting lower!! Chloe, love all your vintage bunnies. The speckled eggs are sweet, too. I think we have some of the same carrots. So pretty, girl. 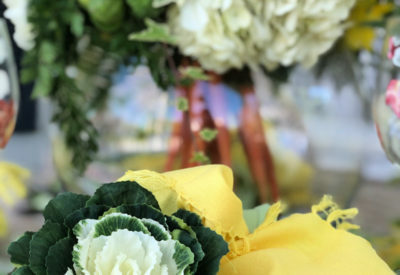 Chloe, I just adore all your lovely spring and Easter decor throughout your gorgeous home! Happy Easter! Chloe you have some sweet festive bunnies and beautiful spring color in your home! I love your moss bunny and the bunny with the pretty ranunnculus. 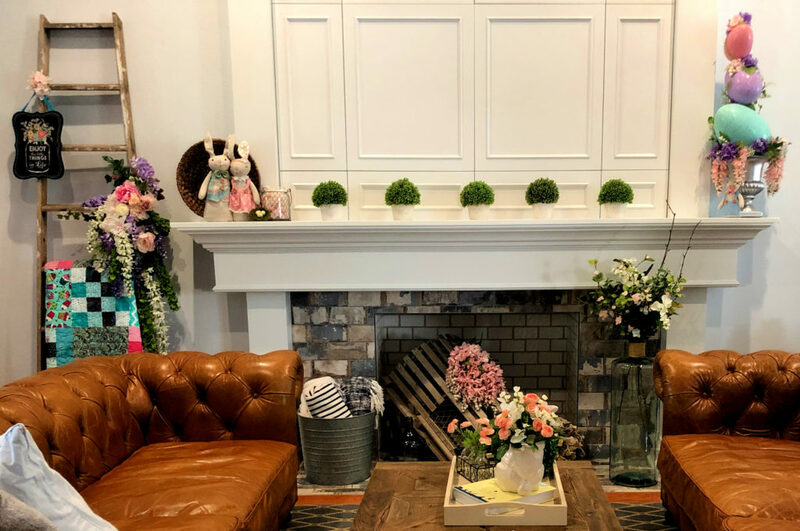 Your family room looks like a great place to enjoy all of your pretty spring and Easter decor too! I am still loving your chinoiserie. This is the first time I have spotted that blue chippy table and I just love it! Thank you so much for joining the hop! Happy Easter! 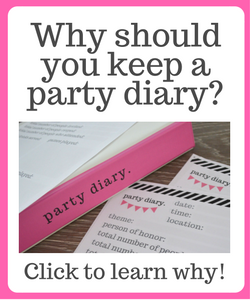 Chloe, I’m finally getting to the last of our blog hop, as I’ve been going in order. I really think your newest bunny is so adorable. HomeGoods is always a hit and miss for me. Actually I love all your bunnies and decorating you’ve done. I’m happy to be in this blog hop with you, my friend! Wishing you a Blessed Easter!